Rank and organization Corporal, U.S. Army, Company B, 2d Battalion, 502d Infantry, 1st Brigade, 101st Airborne Division. Place and date: Quang Tri Province, Republic of Vietnam, 19 August 1970. Born: 14 July 1951, Sharon, Conn.
Cpl. Fratellenico distinguished himself while serving as a rifleman with Company B. Cpl. Fratellenico's squad was pinned down by intensive fire from 2 well-fortified enemy bunkers. At great personal risk Cpl. Fratellenico maneuvered forward and, using hand grenades, neutralized the first bunker which was occupied by a number of enemy soldiers. While attacking the second bunker, enemy fire struck Cpl. Fratellenico, causing him to fall to the ground and drop a grenade which he was preparing to throw. Alert to the imminent danger to his comrades, Cpl. Fratellenico retrieved the grenade and fell upon it an instant before it exploded. His heroic actions prevented death or serious injury to 4 of his comrades nearby and inspired his unit which subsequently overran the enemy position. Cpl. 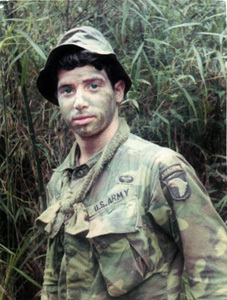 Fratellenico's conspicuous gallantry, extraordinary heroism, and intrepidity at the cost of his life, above and beyond the call of duty, are in keeping with the highest traditions of the military service and reflect great credit on him, his unit, and the U.S. Army. Rank and organization: Private First Class, U.S. Army, Company B, 2d Battalion, 502d Infantry, 1st Brigade, 101st Airborne Division (Airmobile). Place and Date: Near Phu Bai, Thua Thien province, Republic of Vietnam, 26 April 1968. For conspicuous gallantry and intrepidity in action at the risk of his life above and beyond the call of duty. Pfc. Lee distinguished himself near the city of Phu Bai in the province of Thua Thien. Pfc. Lee was serving as the radio telephone operator with the 3d platoon, Company B. As lead element for the company, the 3d platoon received intense surprise hostile fire from a force of North Vietnamese Army regulars in well-concealed bunkers. With 50 percent casualties, the platoon maneuvered to a position of cover to treat their wounded and reorganize, while Pfc. Lee moved through the heavy enemy fire giving lifesaving first aid to his wounded comrades. During the subsequent assault on the enemy defensive positions, Pfc. Lee continuously kept close radio contact with the company commander, relaying precise and understandable orders to his platoon leader. While advancing with the front rank toward the objective, Pfc. Lee observed 4 North Vietnamese soldiers with automatic weapons and a rocket launcher Lying in wait for the lead element of the platoon. As the element moved forward, unaware of the concealed danger, Pfc. Lee immediately and with utter disregard for his own personal safety, passed his radio to another soldier and charged through the murderous fire. Without hesitation he continued his assault, overrunning the enemy position, killing all occupants and capturing 4 automatic weapons and a rocket launcher. Pfc. Lee continued his 1-man assault on the second position through a heavy barrage of enemy automatic weapons fire. Grievously wounded, he continued to press the attack, crawling forward into a firing position and delivering accurate covering fire to enable his platoon to maneuver and destroy the position. Not until the position was overrun did Pfc. Lee falter in his steady volume of fire and succumb to his wounds. Pfc. Lee's heroic actions saved the lives of the lead element and were instrumental in the destruction of the key position of the enemy defense. Pfc. 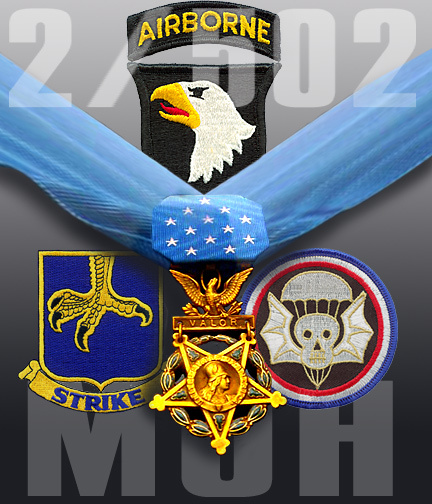 Lee's gallantry at the risk of life above and beyond the call of duty are in keeping with the highest traditions of the military service and reflect great credit on himself, the 502d Infantry, and the U.S. Army. Rank and organization: Specialist Fourth Class, U.S. Army, Company B, 2d Battalion, 502d Infantry, 1st Brigade, 101st Airborne Division. Born: 18 January 1947 Moose Lake, Minn.